In order for your business to succeed and stay competitive in today's global markets, you need to provide your clients with information they can access anywhere. That's why your applications need to be able to run on the Internet. iNomads isn't a virtual terminal or a thin client. Instead, it allows you to run your graphical application on the web on any browser, on any computer, including tablets and smart phones. iNomads gives you the power to take your application to the next level, whether it's selling your product directly to your clients for use on their own in-house systems, taking advantage of a Cloud-based infrastructure or setting up an ASP model and selling access to your application over the Internet to any PC anywhere. More choices mean more opportunities to grow your business. What are the advantages of using iNomads? Using the latest Ajax technologies, iNomads extends standard graphical functionality to provide a better, faster on line experience. It even automatically downloads controls that that maintain large data sets. It's also able to reduce transmissions between the server and the browser, making iNomads, in many cases, faster than Nomads applications. Since iNomads is a true browser-based solution, your application can be easily customized through the use of templates and Cascading Style Sheets (CSS). These allow you not only to wrap your application within web pages but also to independently control the look and feel of many of the controls. Using HTTP and Ajax connections requires no additional ports on the server. This means that as long as the workstation can access the Internet (or Intranet for in-house applications), iNomads applications will always function. This includes the ability to work through firewalls and even Proxy servers. Since iNomads utilizes browser technology, there is no need for a constant connection between the browser and the server. iNomads even has the ability to restore any screen at any time with no loss of data. This allows users to terminate their browser session and re-establish the session at a later time, restoring the screen to its previous state. Allows full use of CSS and other HTML5 design capabilities to suit corporate needs and image. Supports existing Nomads and other graphical applications. iNomads can be licensed as a Add-on product or purchased seperately as part of the WayFarer™ product line. iNomads itself is not a web server. Instead, it uses a web server as an intermediary between your application and the end-user browser. iNomads works currently with either the PxPlus EZWeb server, IIS, or the industry standard Apache HTTP server. When the web server receives a request for an iNomads transaction, it will launch a background process on the host server. The process is assigned a session ID that is used to uniquely identify the process on the server. The process then runs iNomads, which will present your screens as HTML web pages. These web pages are then sent back to the web server for subsequent delivery to the workstation. From there, the background process stays active waiting for subsequent input from the workstation. 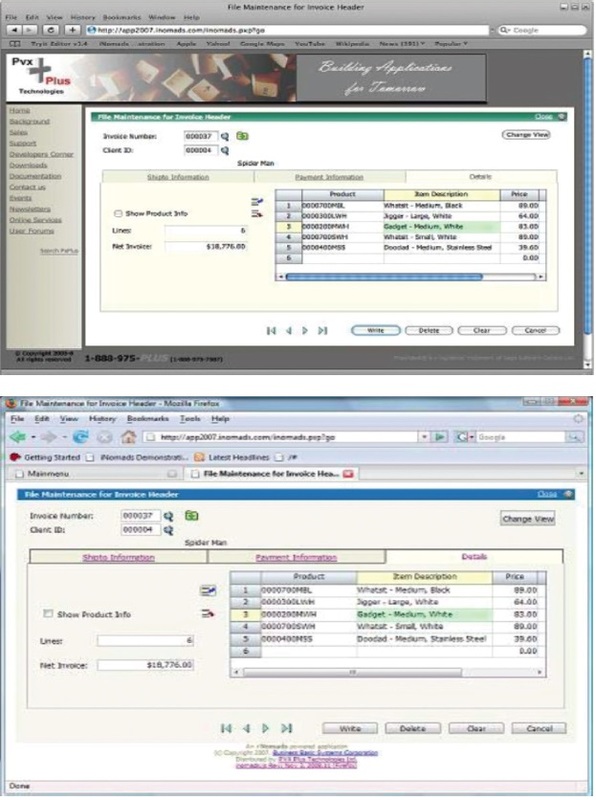 An end-user will see the same basic panel and control layout as they would normally see when running the graphical application. The only difference is the screens are running within a browser. While the Nomads panel library or application control the actual layout of the panel controls, the rendering of the panel can be tailored by using one of our Templates. Our easy to use menu-based configuration utilities allow the developer to externally control visual aspects like font, colors, size, and images along with the ability to wrap the panel within an external HTML-based layout. This allows the same panel to be rendered differently based on the user or application. Copyright © 2005-2019 PVX Plus Technologies Ltd. All rights reserved.